More Bike Racks on the Way? This was the scene in front of the Community Resource Bank’s downtown branch at about 7:30 am this morning. Clearly this bike rack is a well-used resource. The NDDC has been a long-time proponent of bike racks. This scene makes clear that we could use some more. In fact, Jessica Prill, new owner of Oolala, the building pictured in the background, has requested two in front of her store. The Mayor’s Task Force on Streetscape Design meets next week. 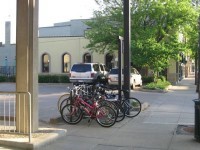 Hopefully we’ll get a few more bike racks ordered and installed this summer in Downtown Northfield. I could use a rack in front of my store or else Swag. Everyone uses the tree or garbage can. Who do I contact?